Mark Current and Rhonda Kidder of the Highland County Community Action Organization, both seated at right, speak to the Highland County Board of Commissioners Wednesday. Also shown is Commission Clerk Nicole Oberrecht, seated at left. 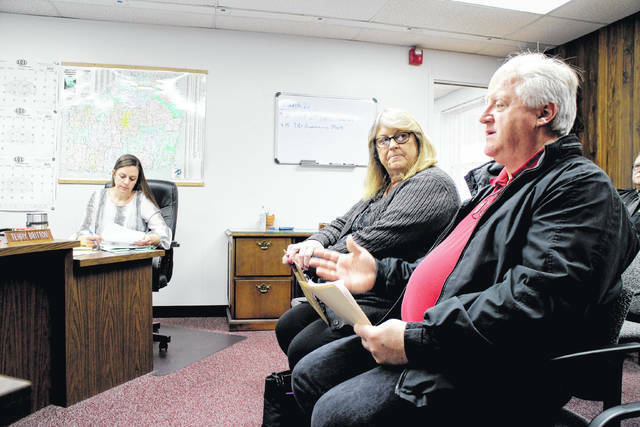 The Highland County Board of Commissioners on Wednesday heard from representatives of the Highland County Community Action Organization about grant funding available through the state’s Community Housing Improvement Program. During a public hearing on the grant at the commissioners’ weekly meeting, Mark Current and Rhonda Kidder of HCCAO told the board that applications for the grant are due in May. Current, the HCCAO’s housing director, told commissioners that Hillsboro City Council will consider legislation entering into an agreement with the county and HCCAO to apply for the grant together. As part of the partnership, the HCCAO will administer the funds, Current said. According to Current, if the full amount is awarded, $400,000 will be earmarked for homes around the county, and $300,000 for homes within the city. Current said the grant funding can be used for home repairs and rehabilitiation if homeowners meet certain income requirements. For more information, visit www.hccao.org/housing. In other business Wednesday, the board proclaimed March Developmental Disability Awareness Month. Commissioner Shane Wilkin said the board had planned to make the proclamation several weeks ago, but it was delayed. The commissioners heard from Nathan Boatman, Community First coordinator for the Highland County Board of DD, as well as several individuals who participate in Board of DD activities. Boatman updated the commissioners on the board’s initiatives and events, including Special Olympics, Board of DD basketball games and a recent visit to the Ohio Statehouse. Boatman said the Board of DD exists to advocate for those with developmental disabilities and ensure they can exercise the same rights as other people. Also Wednesday, Wilkin said he was recently named chairman of the Ohio Valley Regional Development Commission for the second year in a row. Wilkin said negotiations between the county and the Fraternal Order of Police, the union that represents the Highland County Sheriff’s Office, are expected to conclude April 13. The commissioners approved the transfer of an old police cruiser from the Highland County Sheriff’s Office to the Greenfield Police Department. Sheriff Donnie Barrera said the GPD has a newer engine to put in the cruiser, which has been out of service for some time due to high mileage. Commissioners Terry Britton and Jeff Duncan tabled discussion on correspondence regarding a liquor license for the Marshall Mini Mart pending further information. Wilkin did not participate in discussion. The board approved a satisfaction of mortgage for C-Mold, a company that utilized Community Development Block Grant revolving loan funds. Wilkin said the company will soon be bought out, but it has paid back the loan in full. “That’s money we can loan to other businesses now,” Wilkin said. The commissioners also approved resolutions waiving monthly sewer fees for vacant properties and reducing monthly sewer bills for properties that had been over-billed. The board also approved routine financial resolutions. Next week’s commissioners meeting will be held at 8:30 a.m. Thursday, April 5 instead of Wednesday, April 4.